Don’t you just love a good SQL query builder? I found this tool in Rapid SQL easy to learn and easy to produce the SQL I desired. You start it from the menu item Tools à Query Builder. This opens a new tab that contains the available objects on the left, a canvas for the objects when selected on the right and the SQL that gets created as you select various options. Notice in the upper left that you can use Query Builder to create SELECT, INSERT, UPDATE, DELETE, and Create Views syntax. Click on the table you wish to add to your query on the left then click the ‘New’ button along the top (see circle). OK…I’ve put in my EMP and DEPT tables by just clicking on the table labels in the Tables/Views tab and clicking on the ‘New’ button. 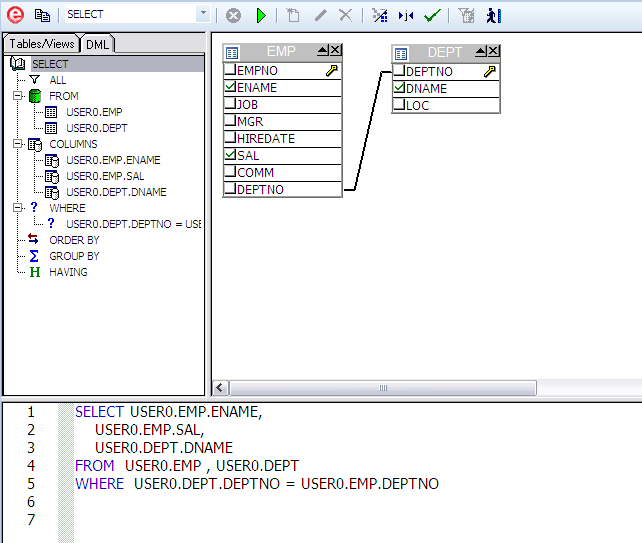 Click on the EMP table columns ename and sal, DEPT tables dname columns. To finish joining the tables…left-click and hold the mouse on the DEPT table’s deptno and drag a line to the EMP table’s deptno. 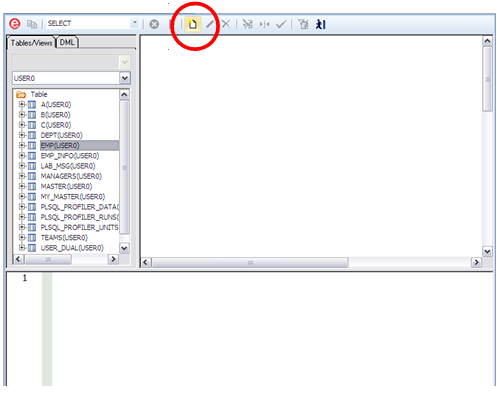 Look what happens to the SQL in the lower panel as you perform these operations! From here you can execute the SQL using the green button or pressing F7. Right mouse click on the bottom tab to save your syntax. Of course you can copy/paste from here into most anything. I hope this technique helps you in your day-to-day use of Rapid SQL. Dan Hotka is a training Specialist and an Oracle ACE Director who has over 36 years in the computer industry, and over 30 years of experience with Oracle products. His experience with the Oracle RDBMS dates back to the Oracle V4.0 days. Dan enjoys sharing his knowledge of the Oracle RDBMS. Dan is well-published with12 Oracle books and well over 200 published articles. He is frequently published in Oracle trade journals, regularly blogs, and speaks at Oracle conferences and user groups around the world.